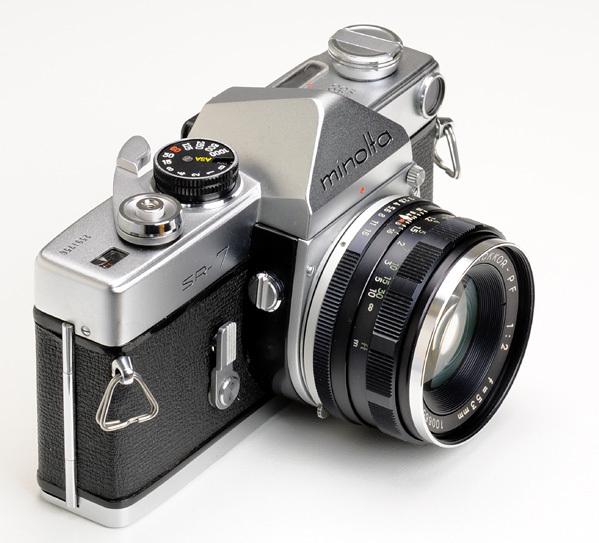 In 1962 the Minolta SR-1 lost some weight, gained some controls and became the SR-7. A welcome addition to the camera was the mirror lock up button. This is on the side of the mirror housing near the self timer lever. The CdS light meter was incorporated into the body, although it still remained only partially coupled. The way it worked was that the meter needle, together with an aperture scale, were visible through a window near the film rewind knob, and the scale moved left or right when the film speed dial or the shutter speed dial were rotated. The user aligned the desirable aperture value on the scale with the needle, and then transferred that value to the lens' aperture scale manually. The CdS meter received the light through a round window situated below the film rewind knob. As in most hand held CdS light meters, this window had a switchable opening; larger for low light and smaller for normal day-light. The push button above the flash synchronisation sockets is the switch. When it is pressed, the scale that is visible through the top window also changes. 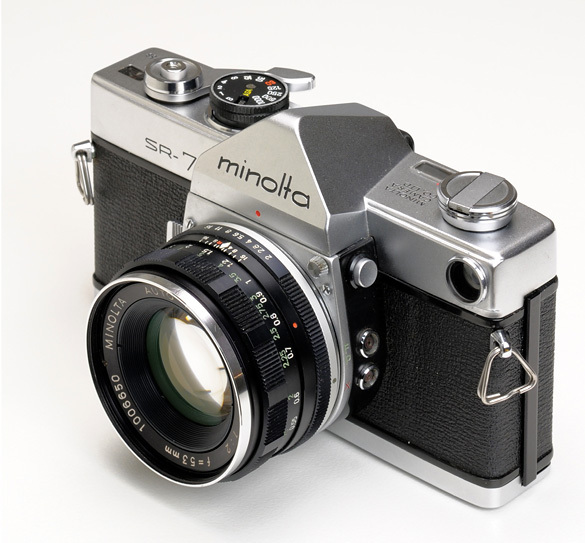 The camera model that followed the SR-7 was the SR T 101. The two cameras share many features and it is interesting to compare them - see this page.